A SpaceX Falcon 9 on the launch pad with the first 10 Iridium Next satellites ready for launch. Credit: SpaceX. Today at 12:54 p.m. EST, SpaceX should return to flight with the launch of a Falcon 9 on the Iridium 1 mission, if all goes well. There’s a lot riding on this mission, and not just for SpaceX. Iridium NEXT satellite. Credit: Iridium. The launch is the first for SpaceX since September when during a pre-launch test on the pad a SpaceX Falcon 9 exploded. The cause was a composite overwrapped pressure vessels (COPVs) inside the second stage liquid oxygen (LOX) tank failing. For SpaceX, this is a critical return to flight launch and there will be some tense moments. 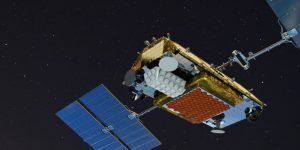 For Iridium, the customer, this is the moment they’ve been waiting for nearly a decade after conceiving of, planning and building their $3 billion next-generation Iridium NEXT constellation of 66 low earth orbit communication satellites with 15 spares, 6 in orbit and 9 on the ground ready if needed. In Canada, exactEarth, through a partnership with Harris Corporation, will have 58 Automatic Identification System (AIS) sensors hosted on the satellites. For exactEarth, this first launch of the Iridium NEXT constellation represents a critical moment for the company. It was less than a year ago it was spun off as a separate company from COM DEV as its parent company was sold to Honeywell. Another key hosted partner is Aireon LLC a McLean, Virginia company which was created in 2012 as a joint venture between NAV CANADA and Iridium. Aireon will have ADS-B (Automatic Dependent Surveillance-Broadcast) receivers providing global real-time aircraft surveillance for Air Navigation Service Providers (ANSP). NAV CANADA is a non-share capital corporation formed in 1996 and according to NAV CANADA manages “12 million aircraft movements a year for 40,000 customers in over 18 million square kilometres.” They are financed through long term publicly traded debt in the form of bonds and notes. They are independent of government funding. You can watch the webcast starting at approximately 12:34 p.m. EST on SpaceQ here.